RP2391 is rated 5.0 out of 5 by 1. Rated 5 out of 5 by tjgchg from Exactly Right This obscure part was hard to find, and was exactly what we needed. Can you buy just the &quot;button&quot; insert for the RP2391 handle? If so, what locations carry it? I have the RP2391 that does use the screw, RP6369. Will the RP2391 that does use a set screw, be able to use the RP6369 screw? I see that the diamond shaped hole is in the center of the RP2389. The diamond shaped hole on the RP2391 is off center. Does this handle fit the diamond stem or the more squared one? My handle fits the stem that is not diamond shaped but more square. If this is not that part/model what is it. Also can the handle be replaced with a more single lever type maybe a H79? Thank you for your question. Delta Faucet model # RP2391 is for our 600 series faucets. If you turn on your faucet by pushing up and then turning to the right or left, you have a 600 series faucet. If you turn on your faucet by just turning right or left, then you have a1300/1400 series. If you have the 1300/1400 series, the H79 can be used as a replacement. If you have the 600 series, you will need to replace a couple of things to switch to a lever handle. You will need an RP70, RP50, RP61 and RP17443. 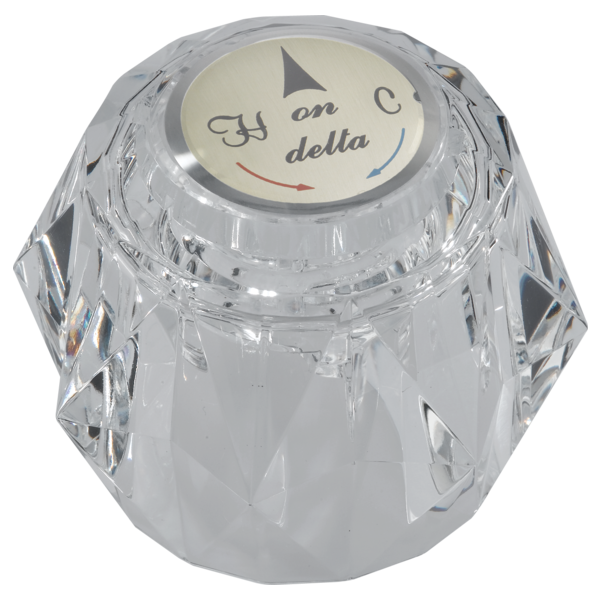 Hi, my knob is the one that has a diamond shape that just pop into and need to put the top screw. Does this part work for this faucet?